ChipRebel has been busy with a Samsung Galaxy S10 teardown and in the process took some incredibly detailed die shots of the Exynos 9820 SoC that is the heart of the flagship smartphone. The Exynos 9 Series 9820 is manufactured on an 8 nm LPP FinFET process and has an integrated Neural Processing Unit (NPU). The “worldwide” variant of the Samsung Galaxy S10 is powered by an Exynos 9820 SoC (there is a Qualcomm Snapdragon 855 in the model for the USA, Canada, Latin America, China and Japan markets). 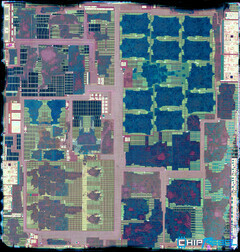 ChipRebel has deconstructed the former worldwide model and taken some photographs of the vaunted Samsung-made processor. The actual die area has been measured at 127 mm², which as ChipRebel points out is bigger than that of the Exynos 9810 (122 mm²). The die area of the Samsung Exynos 9820 is actually larger than all its flagship SoC rivals: Apple A12 – 83.27 mm², HiSilicon Kirin 980 – 74.13 mm², Qualcomm Snapdragon 855 – 73.27 mm². 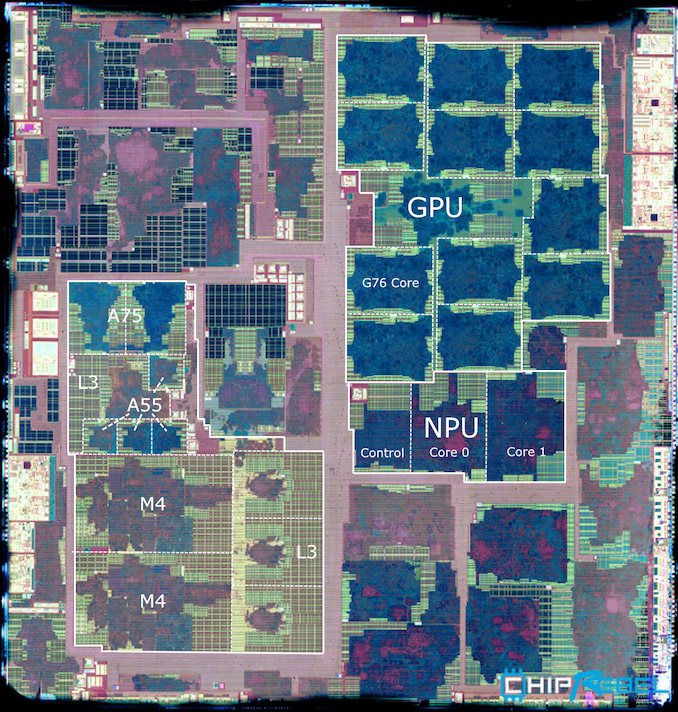 Thanks to some annotations made on the die shot by AnandTech (see below), it’s possible to see where certain components of the Exynos 9820 are located. In the top right corner is the iGPU (ARM Mali-G76 MP12) and directly beneath that is the NPU that assists the Samsung Galaxy S10 with its advanced artificial intelligence and machine learning processes. Taking up most of the bottom half of the left side are the processor cores and L3 CPU cache. The Exynos 9820 is an octa-core SoC, which is made up of four Cortex-A55 cores (1.9 GHz), two Cortex-A75 cores (2.3 GHz), and a couple of powerful Samsung Mongoose M4 custom cores (2.7 GHz). The die shot gives a fascinating insight into the design of the Samsung Exynos 9820.